On Friday 21 October, you turned schools, offices, bus depots, research labs, building sites, tennis courts, and football pitches pink for breast cancer – so we just had to share some of the photos you’ve sent in to us.Thank you for getting your pink on to support our research, we hope you put the ‘fun’ in your fundraising! All of your bake sales, raffles, crazy outfits and pink inspired events fund world-class breast cancer researchers across the UK and Ireland. Together, they’re working to discover how to prevent breast cancer, how to detect it earlier and how to treat it effectively at every stage so we can stop the disease taking lives. As many of you are still paying in your hard-earned fundraising money, we don’t yet know how much you have raised, but you will be the first to know when we do. Remember you can pay your fabulous fundraising in in a number of ways – using our online form, over the phone, in the post or straight to the bank! We wore it pink too! 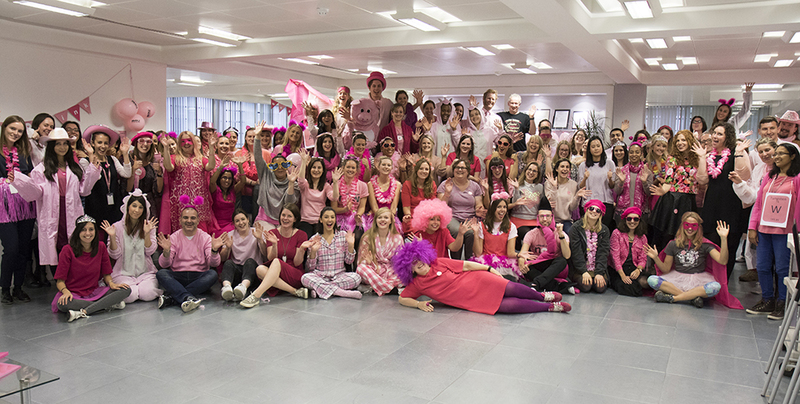 Breast Cancer Now’s HQ was transformed on wear it pink day – a sea of wigs, capes and tutus took over, we had a hotly contested bake off and we even had a pink flamingo flapping about the office! We are always inspired by the outfits and efforts of you all, so once again thank you so much for another amazing wear it pink – we hope to see you again next year!